Zapd is a free app for making almost instant websites with images, links and text. It is my go to app for sharing images with short captions, but you could do much more! 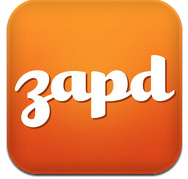 Zapd is an iOS app and website tool for making websites. These can include images as you take them or images from your photoroll on your device. You choose the theme for your website (a color and graphic scheme), then you simply tap the on-screen icon to add a photo, a link or some text. The text is formatted with an optional heading and a body of text. You get to choose before you post your Zapd about the level of privacy of your Zapd site, if you will allow comments, and if new posts will be at the top (like a blog) or not. You can even customize your Zapd site’s address. Only one real downside, a simple Zapd ad appears on all Zapd sites. Imagine this… you are on a field trip with your class to cool location… while you supervise, teach and chase after lost parent chaperones you snap a few pictures of the scenery and the action. While you are riding back to school on the bus you pick a few pictures, add a few comments or labels and by the time the bus pulls up at school you have the address of the Zapd to plop onto your website for parents to check out the moment their children walk in the door (or even before). OR have a documentary of each week by assigning a student each week to create an image and paragraph post sharing the important things happening in school that week, they build an illustrated “yearbook” of sorts. OR have students capture the steps of a process in science or art or math by snapping pictures of it and then adding text to explain the images and post for other students to use as a reference. OR have students capture images and write poetry for the images and create a Poets Hangout website to share. OR take pictures of art and create a simple art gallery online. OR have students illustrate a topic, theme, or unit of study and provide links and text to support their images. I guess I could go on and on… The real deal here is that the tool gets out of the way and allows you and your students to focus on the message, content or communication.